Outline: People continued to sin after Noah died. God gave His law and the Ten Commandments. We have all disobeyed God's law. God judges everyone who disobeys His law. God provided a way of salvation through Jesus Christ. Jesus paid the price for our sins. Story about Mary and Jesus' birth. A little about Jesus' life. Because Jesus never sinned, He could become the sacrifice for our sin. God said, "I am the one true God. You must not worship another god." "You must not shape wood or stone or anything, to bow down to it." God said, "Do not forget to rest on God's day. This day is holy and is for worship." "Honor and obey your father and mother." "You must not commit adultery." God said, "You must not steal." "You must not wish to take that which belongs to another person." Have you obeyed this law? No, in many areas we have all disobeyed God's law. God judges the person who disobeys His law. If you disobey your chief (local leader) you know you will be punished. He will not overlook your rebellion. If you cannot offend the chief and go free, do you think you can disobey God and go unpunished? God punishes those who disobey Him by separating them from Himself forever. The anger of God is against those people. But God does not want to be angry with people, He loves all men and women whom He has created. God has provided a way of salvation from His anger and judgement. He did this by sending the Savior to the world. Do you know who this Savior is? This Savior's name is Jesus Christ. Jesus is the One God has promised who would crush Satan's power. Jesus is our only way of salvation from God's judgement. No other man than Jesus is powerful enough to save us from God's judgement. No man could be good enough to pay for the sins of all people; but Jesus could because He never sinned. Now I will tell you how God sent Jesus into the world. Many years ago there was a young woman named Mary. She was a virgin; she had never slept with a man. She was to marry a man named Joseph. Before they married, a messenger from God came and spoke to her. He said, "God has chosen you from among all women. The Spirit of God will overshadow you. You will bear a Child." Mary said, "I am God's servant. Let it be to me as you have said." Mary rejoiced greatly when she became pregnant. She said, "I praise God my Savior." A messenger from God also came to her fiancee Joseph in a dream. He said to Joseph, "Do not be afraid to take Mary as your wife. What is conceived in her is from the Holy Spirit. She will give birth to a Son. You are to give Him the name Jesus, because He will save His people from their sins." This is what the messenger from God said. Just before the Baby was born, Joseph took Mary to a town named Bethlehem. The town was very full of people and there was no room in anyone's house. They had to spend the night in a stable with animals. (Explain that the stable was an enclosed building where animals were kept or lived.) While they were in this stable Mary gave birth to her Son and they called His name Jesus. That same night some shepherds were watching their flocks in a field. Suddenly a messenger from God appeared. He said, "Don't be afraid. I bring good news. Today the Savior has been born. You will find Him wrapped in cloths and lying in a feed trough." 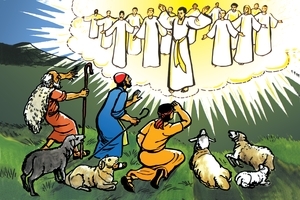 All at once there were many, many messengers from God in the sky who were praising God. They sang, "Glory to God Most High! Peace on earth and good will to men." Then the messengers from God went back to heaven. The shepherds went to Bethlehem and found Joseph and Mary and the Baby Jesus. After they had seen Jesus they told many people about Him. Then they returned to their place thanking and praising God for all the things they had seen and heard. The Child Jesus grew in body and increased in wisdom. He never sinned, not even once. When Jesus was about 30 years old the wisest teacher among His people said about Jesus, "This is the man you should follow." At this time the people saw the Spirit of God come upon Jesus and they heard God's voice speak from heaven and say, "This is My Beloved Son. I am well-pleased with Him." From this time forward Jesus began to teach the people about the true God. The power of God was with Him and He healed people from their sicknesses and chased away evil spirits. Jesus did many miracles. He proved that He was the Son of God. Why would the Son of God come to earth? He came to rescue us from our sins and bring us close to God again. He came to rescue us from the power of Satan and all evil spirits. Satan had no power over Him because He never obeyed Satan. Because He never sinned He was able to become the sacrifice for our sins. He is the only Person powerful enough to save us from God's judgement. Keep listening and I will tell you more of what God sent Jesus to do. GRN has recorded a version of this script in 386 languages and dialects. See full list.